This is the final post on that grammatical bane, subject-verb agreement. To review the basic concepts in previous posts, you can check out Part 1, Part 2, or Part 3. Like this one, all three include free online quizzes to test your knowledge. Remember, verbs should agree in number with their subjects. This is easy enough in typical, simple sentences. But not all sentences are typical or simple. 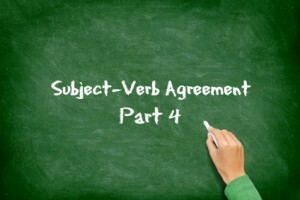 Below I discuss some particular situations that make subject-verb agreement complicated. 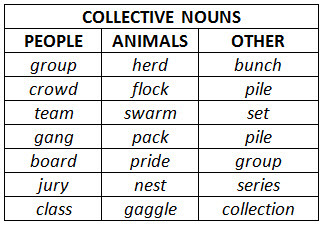 Collective nouns are particularly tricky because they can be either singular or plural depending on context. If the group is acting together as unit, use a singular verb. When the group are acting as separate individuals, however, the plural verb is preferred. The team plays on Tuesday. The class meets for an hour. The sales staff is vital to the company. The team are casting their ballots for captain. The class always raise their hands before asking a question. The sales staff receive their paychecks on Friday. Note: In ordinary daily usage, the singular verb is almost always preferred with collective nouns. This is one of those areas where there is debate about who sets the rules — textbooks and grammar experts or ordinary speakers and writers of English. Few people would correct you for saying, “The sales staff receives their paychecks on Friday.” But if you are writing formally, you might use the more “correct” plural verb in this case because the staff are acting as individuals. 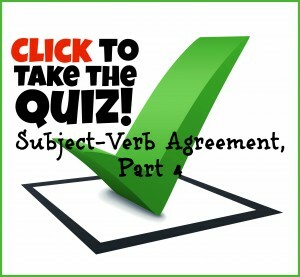 Athletic teams, bands, and other groups that form collective names pose particular problems with subject verb agreement. Most sports teams are plural: the Eagles, Pirates, Cubs, Red Wings, Lakers, etc. For this reason, writers have taken to using plural verbs with them. The Giants are looking strong this season. I think the Cubs have a chance to win their division. Some disagreement has arisen, however, about a handful of teams that have a singular name, such as the Miami Heat, Orlando Magic, and Colorado Avalanche. Some sports writers use plural verbs to maintain consistency: The Jazz are suddenly slumping. Others think it’s more natural to treat these names as singular: The Heat is a favorite to repeat as NBA champs. Because opinions are divided, we suggest going with what sounds best to you. Band names are treated as singular or plural depending on the name. Plural names (e.g., The Beatles, The Killers, The Flaming Lips) take plural verbs and singular names (One Direction, Fun, Switchfoot) take singular verbs. Thus, you would say The Rolling Stones are old and U2 is awesome. With fractions and percentages as the subject, look at the noun in the of phrase — the object of the prepositional phrase that is likely to follow it. If the noun is singular, use a singular verb. If it is plural, use a plural verb. In other words, the number of the verb depends upon what the fraction or percentage is of. Half of my brain is asleep. Half of the goobers have been eaten. One-third of the cheese is moldy. One-third of high school students drink coffee. Ten percent of what you hear on the radio is incorrect. Ten percent of left-handed zombies can juggle. Titles of book, movies, and music are always treated as singular. Cats remains a popular Broadway musical. Bedknobs and Broomsticks was my favorite book as a child. “Wild Horses” was a surprise hit song for the Rolling Stones. When talking about sums of money, periods of time or measurements of distance, use a singular verb. This may seem counter-intuitive at times as these measurements seem to be in the plural. Twenty-thousand dollars is a lot to spend on a car. Sixty-two miles is all we have left to drive. As complicated as subject-verb agreement rules seem to be, native speakers of English have an ear that can be trusted in most cases. Fortunately what sounds right is most often the standard, accepted usage. Still, it’s a good idea to learn about these pesky exceptions. Think you’ve got it down? Take the quiz below and find out! Can You have an Examples Collective Nouns with have an verb is/are ? I’m not sure I understand the question, Lindley. Interesting points about collectives, especially when talking about band names. In British English, there’s no such thing as a singular collective — that’s why you see “Led Zeppelin were an English rock band” on Wikipedia, for example. Huh. You’d think the English would learn how to speak our language better. 70% w/o looking at the post. 🙂 I take exception at n.7. Why do you count “gang” as plural? It just doesn’t sound right. It seems as if it should at least be subjective. I explain it in the post, Amber. It’s a tricky one for sure. I got 90% – I got the first one wrong. I picked the “Either is correct” option because I thought it was supposed to be subjective. . . .
Yeah. Both of the questions that I got wrong were collective nouns that I messed up on. They were the “flock of seagulls”, and the “gang”. I think when I read gang, I thought members of the gang, or something along those lines 🙂 . Not, bad. 80%. Thanks a lot! Not bad. Do you understand what you missed?